You fly in style - why shouldn't your pampered pet? 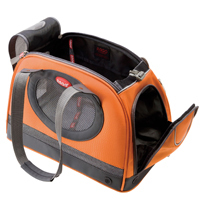 Finally ARGO launches a bigger size carrier for the pampered pooch. 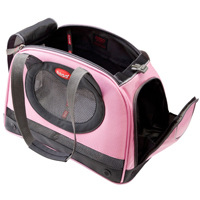 The Petaboard Style B Medium carrier is an affordable yet exclusive carrier. With all the hard work and thought, the Argo design team has successfully designed a carrier that combines travel shelter with style and quality. 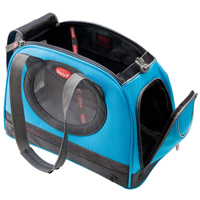 The Petaboard carrier is also designed to meet strict IATA airline pet carrier regulations, while maintaining the safety and comfort of the furry “paw-senger” (passenger). The carrier slides conveniently underneath the airline passenger seat. 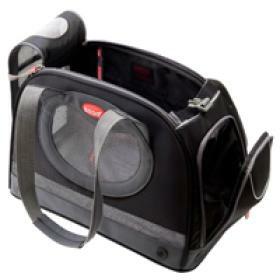 It has an extra pocket for storage on its side, has three dual mesh windows for consistent ventilation flowing in and out of the carrier from different directions, the back of the carrier features a pocket and sleeve that slips over an extended luggage handle, the sleeve can also secure pet in the car with a seat belt. The carrier also comes with a removing padding that is easy to clean when you are on the go. The Petabaord Style B Carrier is available in Black, Petal Pink, Kiwi Green, Berry Blue, and Tango Orange. It is suitable for pets up to 12 Lbs. 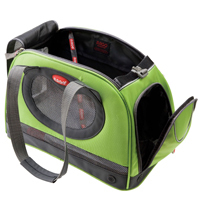 For use with an airline, please contact the airline with plenty of time to determine if this pet carrier will meet the specifications for your specific flight. Every airline and every flight has different requirements. This product has a 30 day return policy on unused items. Due to sanitary reasons, no used items can be returned. Used items will be returned to customer. Customer has 30 days from the time product was received to initiate a return. All returns must have an RMA#. RMA#'s are valid for 15 days. Returns not indicating the RMA# on the box will be rejected, and all return charges will be charged to the customer. There is a 20% restocking fee on all returns. All items must be returned NEW in it's original condition, original packaging with all accessories.